The Backyard Farming Connection: Why Homestead? So, have you heard the hype? Homesteading is the new 'in' thing to do. Perhaps you've seen a magazine with a headlines about homesteading, backyard farming, micro-farming, urban farming, or hobby farming. Maybe a co-worker mentioned she's keeping backyard chickens. Possibly you've been seeing those signs for the local farmers market popping up everywhere you go. All around us, people are making the choice to live closer to the earth, to re-connect with the food chain, to take charge of where and how they spend their money, to engage in the process of making food, clothing, and home goods, and to make conscious choices about how they live. Some people see this as the latest craze, but for many of us, choosing to homestead is a way to step backwards and reclaim our lives. It is not a fad or a craze, it is simply a choice about how we live. Choosing to homestead does not mean that you are turning away from all modern conveniences and looking for a piece of rural land in the boonies. For some people, this is the dream, but for most of us, modern homesteading means finding a balance between new and old. There are so many reasons that people are choosing this way of life, and most people are making their decision based on several reasons. Here are several reasons people are choosing to homestead. In our modern world, the rural, farming life is constantly romanticized. Movies, ads, books, music, and even blogs idealize what life is like for the farmer, but they also offer an alternative vision of life for people who don't have the opportunity to spend their days shoveling out animal poop and weeding their gardens. For people caught in the rush of busy lives, the idea of homesteading provides the opportunity to step back and simplify life. Homesteading is hard work, but it is also rewarding. If you are looking to slow down, homesteading may be just what you're looking for. Being able to provide food and other items for you and your family is a simple joy itself. Many people choose to homestead for the ability to become self-sufficiency, whether they want to be prepared to survive in case of an emergency or just value sitting down to a meal they've grown from scratch. Homesteading is a wonderful way to share values with your family. Homesteading teaches responsibility, the importance of hard work, compassion, and the benefits of authenticity. Sure you don't have to homestead to share these values, but the basic work and emphasis that occurs on a homestead lends itself to these values. Sharing the experience of raising your own food with your children or other family members takes the experience one step further. For many people, the joy of spending time with animals and getting their hands in the garden is reason enough to choose a homesteading life. Whether you choose to keep animals for the eggs they produce, for the wool you harvest, or for the companionship, keeping animals can enrich your life. For those with a green thumb, or for those who want to have a green thumb, spending time in the garden is soothing and can be a wonderful hobby, or can become even more. While homesteading is not the answer to making your fortune, many people find security in knowing that they have food growing in their own backyard in case of tough times or an emergency. Having the tools at hand to supplement your needs financially and otherwise can bring piece of mind. It is so hard sometimes to know the best way to help the earth. All around us, people are concerned about pollution, climate change, deforestation, and countless other environmental issues. By homesteading, you are taking charge of a small part of your impact on the planet and paying attention to how the decisions you make affect the natural world. Small changes in the way you live your life can make a difference. What reasons are the most important to you? 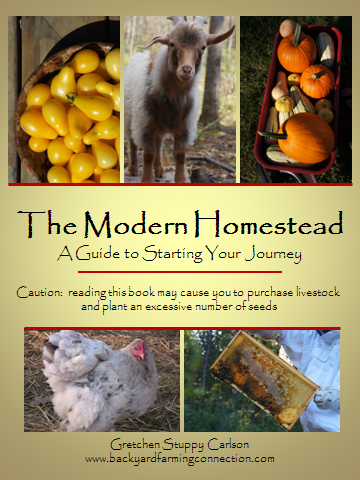 Are you interested in learning more about homesteading? Are you ready to get started? Are you already homesteading and interested in setting new goals for the future? Subscribe to my blog via email, and I will send you a free copy of The Modern Homestead: A Guide to Starting Your Journey - coming Dec. 10th. My reasons for homesteading are two fold, the first is to provide healthy and nutritious food for my family and the second is to simplify my life and reconnect with nature. My life had become me working like crazy to earn more and more money and I am just not happy doing it anymore. I am now taking steps to simplify and slow down so I can begin to enjoy my life, my family and the people around me. Working outdoors and farming is hard work but it is also very rewarding. Knowing that I worked hard to provide food for my family is far more satisfying than what I am doing now. Can't wait to read your book!! Deep down for me, it's about living a more purposeful life and leaving a legacy. Hopefully we'll hear tomorrow that the appraisal is good and the mortgage underwriter can say yes to our financing because after Christmas, we'll be moving to our 40-acre farm in southwest VA.
Great post! We really became what I'd call "homesteaders" after we got our chickens. We became homesteaders because we wanted to take control over our food and what goes into our bodies. We don't feel comfortable eating food that we don't know where it has been or what chemicals the food has been doused in. Of course, we still go to the grocery store and out to eat on occasion, but we consciously try to grow most of what we can or buy local and cook from scratch most of the time. Also, because it is so enjoyable! Personally, I am the happiest when I am taking care of the chickens or tending to the garden. It's just the way of life that I love and what makes me happy. We have a small hobby farm and just getting started. Your book seems to be the ultimate "how to" guide. Thanks for sharing your knowledge. Thank you for sharing. We just recently purchased a 1935 farmhouse on 3 acres in rural Missouri. I've always lived in a suburban area. It is a huge difference between the two, but I LOVE living on my own little patch of ground in the country. Congrats on you move! It's amazing to have a little space! We decided to homestead for a number of reasons. We wanted to grow our own food, we wanted to live in the country after the quality of our neighborhood in the city began to decline, we wanted to be self sufficient and decrease our living expenses so my husband could spend less time at a high stress job that took him out of the home every other week. We've only just been here about two months but we've really enjoyed the experience so far. Gretchen...wonderful post! This would also be a great one to share at Wildcrafting Wednesday! My reasons are multi-fold. One is almost certainly a romanticized view from reading so many Little House books while growing up. But I also desire to live a more natural, crunchy granola, sustainable lifestyle. I also desire to be able to know my (future) family is provided for - esp. with the political and economic climate these days. Thanks for the post. I have some chickens and I do a little gardening, always with that dream of farming bigger or smarter but that requires getting everybody in the family on board. I grew up in rural North Carolina and the simple things in life is where I find my joy. I find it wonderful and inspiring when others enjoy those same things. Homesteading is like the new old thing.LOL.